The all new RYOBI 18V ONE+ Floating Speaker/Light Show splashes onto the scene as one of the newest additions to the ONE+ system of over 100 tools. This Bluetooth speaker allows you to play your favorite music and put on a light show, all at the same time! With 3-modes of operation, it gives you the ability to have the lights play along with your music, slowly across all colours or not at all. The IPX8 waterproof, and flip resistant design make it perfect for tossing into the pool or taking out on the boat. The RYOBI 18V ONE+ Floating Speaker/Light Show is sold as a bare tool, but like every other ONE+ tool, blue or green, works on all ONE+ batteries. The BR250 is a Video Borescope Inspection Camera with a 9 mm camera diameter and 3.5 inch colour TFT LCD Monitor and is ideal for Home Inspection (Inspect in walls for meld, insect infestation, electrical wire or water pipe location); HVAC ( Inspect inside ducts, behind motors and compressors); Automotive (View inside or around engines and transmissions); Industrial (Inspect weld integrity, process equipment, gears, moulding machines); Aerospace (Aircraft inspections for contamination, debris, cracks or other damage), and Government (Safety and security inspections) applications. Glare-free close-up field of view. Detachable wireless colour display can be viewed from a remote location up to 32 feet from measurement point. Complete with 4 x AA batteries, micro SD memory card with SD adapter, USB cable, extension tools (mirror, hook, magnet), video cable, AC Adapter (100-240V, 50/60Hz), magnetic base stand, and hard case. The Milwaukee 2313-20 M-SPECTOR 360 Rotating Inspection Scope features a ground-breaking rotating display enabling the user to orient the image without having to fight the cable. With a dense 640x480 digital image sensor and 4 LED lights, the M-SPECTOR 360 delivers best in class image quality without shadows or glare. The larger 2.7 LCD display and 9mm aluminum head provide easy viewing in the tightest of spaces, while optional accessories that attach to the cable head add to the versatility. With unmatched image control, clarity and brightness, the Milwaukee 2313-21 M-SPECTOR 360 delivers a unique solution to improve the productivity of any professional. 18V Floating Speaker/Light Show with Bluetooth The all new RYOBI 18V ONE+ Floating Speaker/Light Show splashes onto the scene as one of the newest additions to the ONE+ system of over 100 tools. This Bluetooth speaker allows you to play your favorite music and put on a light show, all at the same time! With 3-modes of operation, it gives you the ability to have the lights play along with your music, slowly across all colours or not at all. The IPX8 waterproof, and flip resistant design make it perfect for tossing into the pool or taking out on the boat. The RYOBI 18V ONE+ Floating Speaker/Light Show is sold as a bare tool, but like every other ONE+ tool, blue or green, works on all ONE+ batteries. 18V Floating Speaker/Light Show with Bluetooth is rated 4.9 out of 5 by 19. Rated 5 out of 5 by Paul from Great Speaker! 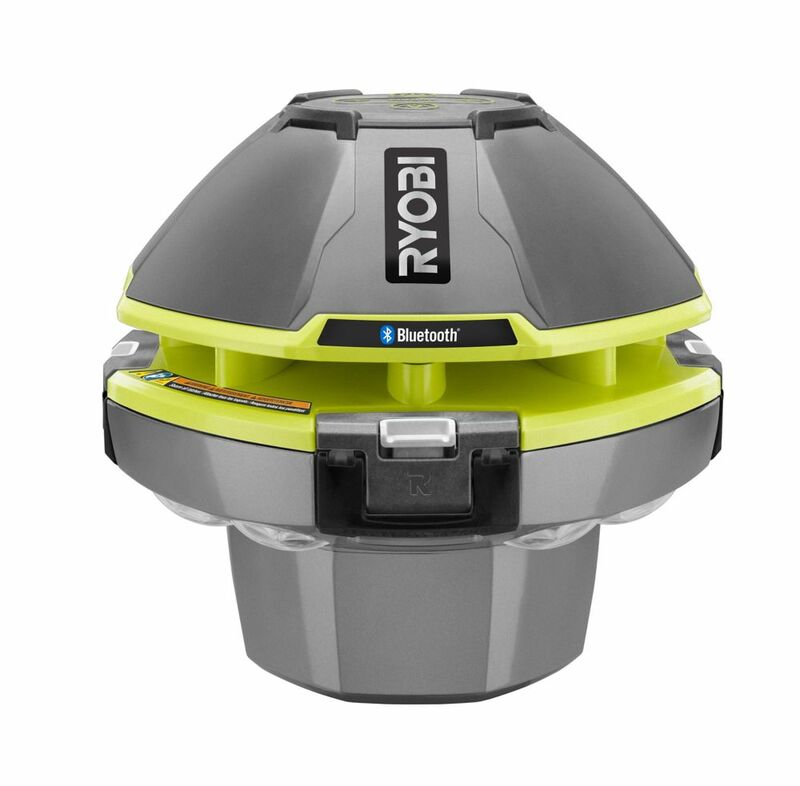 We love our Ryobi pool speaker and that it works with all our other tools! The kids love the light show and it will be used all summer! Rated 5 out of 5 by fagiles38 from We love listening to music while in our pool. This product is amazing and syncs easily to all of ... We love listening to music while in our pool. This product is amazing and syncs easily to all of our bluetooth devices! Great sound! Rated 5 out of 5 by Jean from This is an awesome little device. I love that it uses all of my ONE+ batteries. Will be great dur... This is an awesome little device. I love that it uses all of my ONE+ batteries. Will be great during the summer for pool parties and casual lounging. The speaker sounds great and the light show is an awesome touch. Rated 5 out of 5 by Jak from I bought this speaker for a backyard pool party and it was perfect. It was so easy to use; it was... I bought this speaker for a backyard pool party and it was perfect. It was so easy to use; it was out of the box and floating in the pool within a few minutes. The sound is clear and loud and the lights are amazing! Rated 5 out of 5 by Jess from Best pool accessory yet! This product both amplifies your music and creates a light show all ages can appreciate and enjoy. The lights project throughout the entire pool and the speaker works great. Kid friendly and mom approved, I highly recommend this product to anyone and everyone. Thumbs up! Rated 5 out of 5 by OZ17 from I was amazed at the quality of sound from this floating speaker. I love the portability and long ... I was amazed at the quality of sound from this floating speaker. I love the portability and long lasting battery. Great product!! !